Formerly marked with "Ribāsu: "
Formerly marked with "Reverse: "
Formerly marked with "리버스: " "Ribeoseu: "
Marked with "反轉：" "Fánzhuǎn: " / "Faan2 zyun3: "
A Flip effect (リバース効果 Ribāsu Kōka "Reverse Effect"), formatted Flip Effect prior to the version 9.0 TCG rulebook, is a kind of Trigger Effect possessed exclusively by Flip monsters. This kind of effect activates when the Flip monster is flipped face-up (by battle, a Flip Summon, or a card effect). In card text, a Flip effect is prefixed with the all-caps text "FLIP: ". 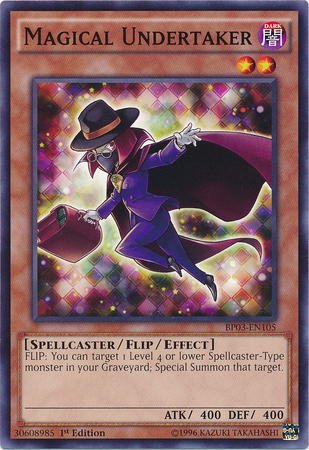 Prior to version 9.0 of the TCG rulebook, Flip Effects were considered a distinct kind of effect from Trigger Effects, and several card effects specifically affected Flip Effects; such cards now instead affect all effects of Flip monsters. If the monster is flipped up and destroyed by battle, the card is destroyed first, then its effect is activated and resolved on the field in the Damage Step after damage calculation; since the card is already destroyed, effects like that of "Hane-Hane" cannot target themselves. Not all effects that activate upon the monster being flipped face-up are Flip effects. If a monster is not a Flip monster (such as "Snowman Eater"), any effect it has that activates upon being flipped face-up is not a Flip effect. Likewise, not all Flip monsters have effects that activate upon being flipped face-up, such as "Worm Linx" and "Aroma Jar". In Yu-Gi-Oh! The Duelists of the Roses, a Flip Effect is a one-time effect that is activated only when the card is manually flipped face-up or as a result of another event, such as battle. ↑ "Traditional Chinese version of Master Rule 2 version 1.0". Konami.